F3 GPS Swivel Mount Fits Garmin 660, 665 and the new 590, 595 & 396 GPS mounts. Must have Lamonster F3 Bar Clamp (LG-1023), Dual Power Plate F3 (LG-3006) RT (LG-3005) , Monster Mount F3 (LG-3007) RT (LG-3008) (SOLD SEPARATELY) to mount Swivel on. 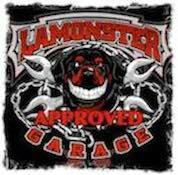 All Lamonster parts are made in the USA and start from a solid piece of T-6061 billet aluminum. For questions on this product CLICK HERE. The piece is solid, well made and durable. Instructions were not included, but if you can't figure it out, you don't need a GPS! Fits my power plate perfectly. Very unobtrusive on the center of the handlebars. I'm running an older Zumo 550 and it attached with no problem. I rate it at 4 Stars instead of 5, only because it adjusts up or down with no side to side adjustment. Really a great piece. Fit perfectly on the new bar clamp for the F3. Initially ordered the bar clamp only. After realizing the ball mount I had planned to use was too high, I contacted the seller about the swivel mount. Received order quickly. Mounted it the same day it arrived. Fits great o the F3. I recommend getting the full mount.